The Fields Institute for Research in Mathematical Sciences aims to "enhance mathematical activity in Canada by bringing together mathematicians from Canada and abroad, and by promoting contact and collaboration between professional mathematicians and the increasing numbers of users of mathematics." They support research in pure and applied mathematics, statistics and computer science, as well as collaborative projects between mathematicians and those applying mathematics in areas such as engineering, the physical and biological sciences, medicine, economics and finance, telecommunications and information systems. 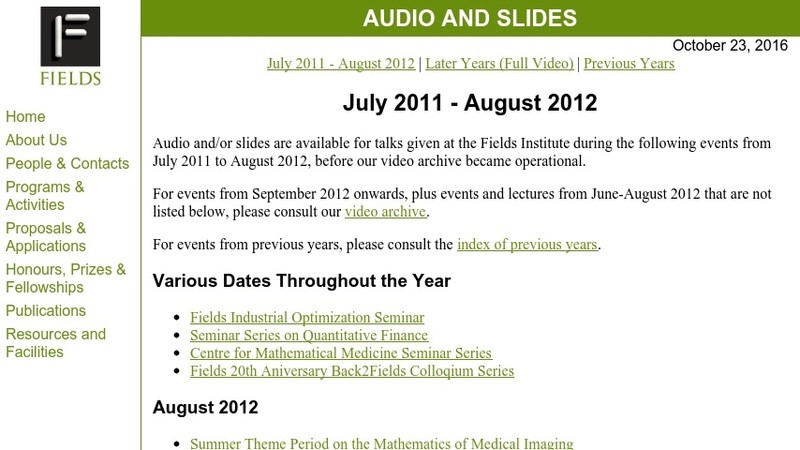 They offer this website with audio files and slides from events and lectures at the Fields Institute. The lectures, given by scientists from around the world, address such topics as Quantitative Finance, String Theory, Homological Algebra, Combinatorics, and much more. The files are organized by academic year and series title. In cases where the files are not available to download, they provide information on how to obtain the files.